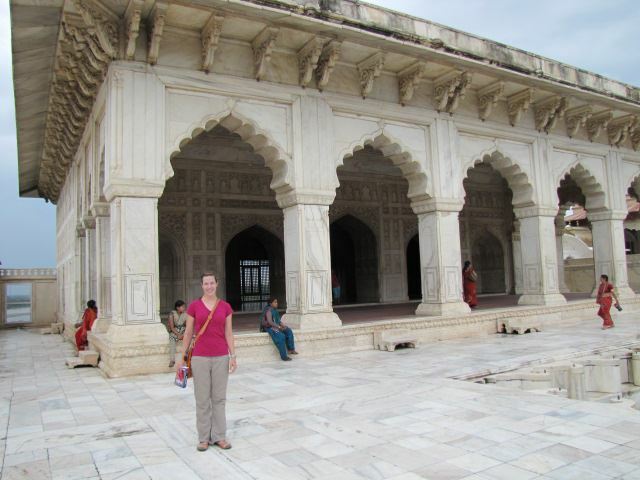 I had an almost-unfortunate incident occur while I was in India. I wanted to post about it at the time, but I thought it might be prudent to return safely to the US and freak my family out in person. So now that I have successfully done both, I'll tell you what happened: my wallet was stolen. But don't worry, everything is ok because I stole it back. I am so ninja. The scene of the crime was Agra Fort in the city of Agra. 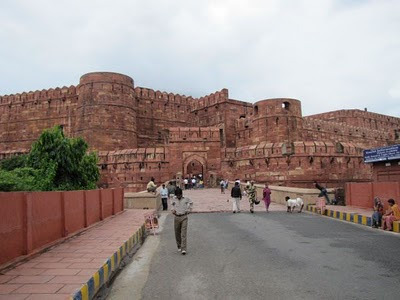 The fort is the second most popular attraction in the area, falling under the great big popular shadow of the Taj Mahal just down the river. 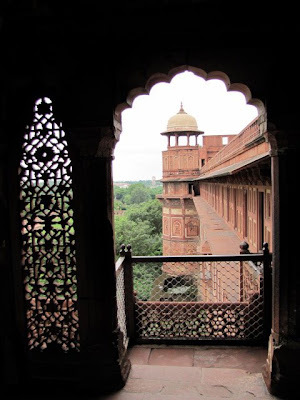 Agra Fort is a supremely massive structure made of red sandstone and white marble. This sucker demands attention, and you have no choice but to give it because the place is so freakin' big that you simply can't miss it. It's history is also intertwined with the Taj - the builder of the Taj, Shah Jahan, was imprisoned in Agra Fort by his own son for his utterly lavish spending on things like, well, the Taj. Sarah and I found ourselves among throngs of other tourists running around Agra Fort. It's a dadgum impressive place. As we walked up a narrow staircase, I noticed that a woman with a baby was climbing up very close to me - too close. She was almost aggressive about it. And then I felt it - movement around my purse. I knew exactly what was happening. $#8&. I checked my purse when we came out onto the courtyard at the top of the stairs. Sure enough, my wallet was gone. I asked Sarah if she could see the woman, and she spied her on the other side of the courtyard. I went sprinting after her with Sarah at my heels. I tapped her on the shoulder. "You took my wallet. Give it back. I'm going to get the police. I'm a diplomat." I am so not a diplomat. She turned and gave me a quizzical look, then started speaking Hindi and shaking her head. She looked very odd, like something out of Alice in Wonderland. She started to walk off in a slow, gliding, almost practiced way. I stopped her and repeated what I'd already said. "Give me my wallet back. I know you have it. You are going to be in serious trouble for stealing from a diplomat." I am still not a diplomat. She said something more in Hindi, shook her head again, and patted her purse. Ah ha! She knew exactly what I was saying. I started to wonder if she was drugged up. Her speech and her movements were just downright strange. She seemed to be floating in some other world. So did the baby, for that matter. Apparently, I was causing a scene, as Sarah informed me later. I wasn't screaming at the woman, but I was sure as hell demanding my wallet back. And I wasn't about to take my eyes off of her. The woman floated down a staircase back to a lower courtyard. I followed, still claiming to be a diplomat, Obama's third cousin twice removed, a flying monkey, and whatever else I could think of to try to get her pony up the wallet. At the bottom of the staircase was a single step up into the courtyard itself. The woman stepped onto it, and as she did, she turned around to mumble Hindi at me again. As she did, I leaned down and saw... my wallet! She was holding it between the baby's legs. I swiped it out of her hand. Shoot, she hadn't even had a chance to open it. I looked back at her, and she gave me a look that said, "Well, that's a bummer," and she floated off. Of course, there were no police to be found. But hey, I had my wallet back - my rupees, my US dollars, my credit card, my drivers license, my ATM card, and the wallet itself (don't judge - I really like my wallet). How's that for some ninja skills? Ok, ok, fine, I admit it. I'm about as ninja as Justin Bieber. I just got really, really lucky. Kids, watch those purses and pockets! It was easier to cause a scene than to go about trying to replace my credit card, ATM card, drivers license, etc. And thank you!